Comparisons with counterfactual outcomes can influence choices in sequential decisions. 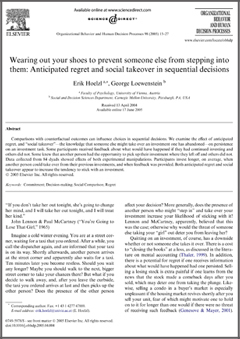 We examine the effect of anticipated regret, and “social takeover”—the knowledge that someone else might take over an investment one has abandoned—on persistence on an investment task. Some participants received feedback about what would have happened if they had continued investing and others did not. Some knew that another person had the opportunity to pick up their investment where they left off and others did not. Data collected from 84 dyads showed effects of both experimental manipulations. Participants invest longer, on average, when another person could take over from their previous investments, and when feedback was provided. Both anticipated regret and social takeover appear to increase the tendency to stick with an investment.